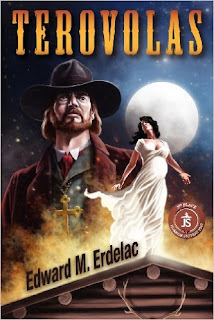 Dr. Abraham Van Helsing travels to Texas to deliver the cremated remains of Quincey Morris to his brother Coleman, encountering werewolves in the process. Van Helsing twice refers to an adventure he had with his colleague Hamish and his famous friend, the Great Detective. Apparently Van Helsing prefers calling Dr. John Hamish Watson, Sherlock Holmes’ best friend and biographer, by his middle name. The afterword describes how Erdelac discovered Van Helsing’s papers at the University of Chicago in 1997. The papers had been earmarked for the Ravenwood Collection. The Collection is named for Abner Ravenwood, Indiana Jones’ archaeology professor at the University of Chicago and the father of his future wife Marion. Among the names listed in the acknowledgments are Dr. Byron McFynn Jr., History Department, Marshall College, Connecticut (the school Indy taught at); Professor Stanislaus Laff, History Department, Empire State University, New York City, New York (the college attended by Peter Parker, aka Spider-Man); and Professor William Wallace Spates III (the grandson of Professor Alfred William Wallace Spates from Erdelac’s Merkabah Rider books, himself based on a reference to “Spates’s catalog” in the movie Ghostbusters), Special Collections, Miskatonic University, Arkham, Massachusetts (the site of numerous Cthulhu Mythos stories by H.P. Lovecraft and others.) Quincey Morris’ body being recovered and cremated does not fit with the events of P.N. Elrod’s novel Quincey Morris, Vampire, which Win included in the original volumes, and so this book, while very good, unfortunately cannot be included in the CU. I haven't read this book, so I really don't know, but there's no plausible workaround to reconcile it with the CU, such as positing a body-switch or Van Helsing simply mistakenly believing he's got Morris's remains? Since someone would have had to substitute a body that looked exactly like Quincey in order to fool Van Helsing and his allies, I don't think it very likely.